Firstly welcome to my website, and thanks for taking the time to read this little section of it. Here I shall tell you about myself and the journey i've been on to get to where I am now. From a very early age my parents let me take control of a camera. My first memories of using one were at animal and bird parks which is where I got my first bit of recognition (kind of) snapping a photo of a swimming Penguin at Bird World in 1997 when I was 7 years old. Winning me a Boots competition in my home town of Trowbridge and being awarded my very own camera.. and so began the journey! The first time I truly became obsessed with camera's was at the age of 14 when me and my friends used to camp out every year in a farmers field and I attempted to capture it all with my video and stills cameras. I always remember taking the image above. The composition seemed perfect but next I tried to capture them jumping off into the water.. and this is where my obsession really began, using a 4MP point and shoot camera with no manual controls, of course every image of them had motion blur. And for me, that just wasn't good enough. So the following year as soon as I turned 16 I got a job at the local camera shop Clives Camera's where I worked every Saturday until I could afford my first proper camera, a Nikon D50. That's when I first started to experiment with what a camera could do, playing with various shutter speeds and settings to capture interesting images. Once I left school I went to study my A Levels at Bath College taking courses in Art, Film, Media, IT and Photography. I failed 4 of those, but of course the one course I would pass would be... Photography. I then went on to achieve a National Diploma in Photography at Trowbridge College the following year. I was now 19 and was looking into Degrees in Photography and came across Plymouth. I got onto their course, but this is where my life would change forever. Coming home from Uni for the weekend I began to feel extremely ill and the next thing I remember is being woken by my Dad and then being taken into Hospital by Ambulance. I had contracted Meningitis and although very lucky to be alive awoke to find that I had lost most of my digits on my right and left hands. But don't think this is a sob story, I never recall a feeling of 'how will I be able to do photography now, my career is over before it had begun' I can't lie the following year of recovery was challenging but slowly I got back to good health and once again started taking photographs. Still determined I got back to applying to Universities and was accepted onto the Degree course at UCA Farnham in 2011. In 2012 a good friend gave me the opportunity to photograph their wedding and although it may have been one of the scariest responsibilities I had ever had, it set me on a path that I am now truly grateful for. Throughout my time at University I produced many different projects resulting in my final documentary piece where I looked back at my time in Hospital. Creating GIFS that showed the before and after of various times in my life I am always looking at different ways to tell a story. Graduating with a Degree in Photography in 2015 I believe it's only onwards and upwards from here. Creating beautiful, creative wedding photography is my true passion. I want you both to look at those photographs and completely relive your day, feel what you felt in that moment, and look through those photos with a huge smile on your face. Capturing the story of your wedding day as it unfolds. I’m there to capture those feelings and emotions, whether that's tears of joy or full on laughs. 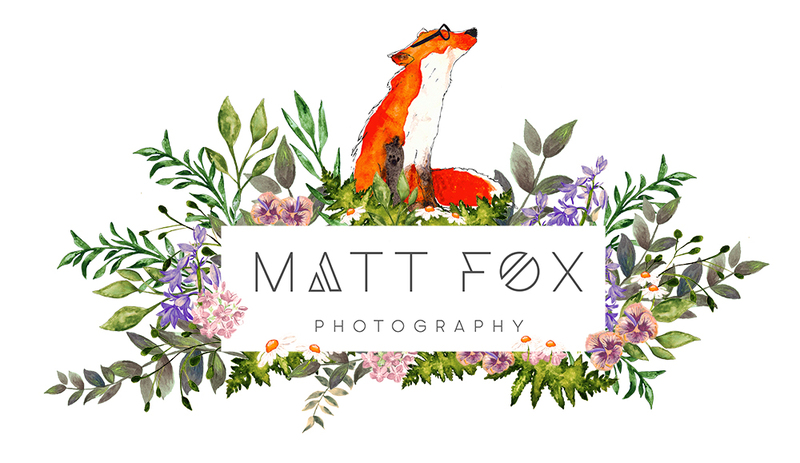 So to start a conversation please drop me an email at matt@matt-fox-photography.com and I will be happy to go over all of your plans and questions. Thanks for taking the time to read this and I hope it gives you an insight into who I am.